I try to keep my food blog only about Algerian/ Moroccan and North African cuisine in general, but when something as memorable as these little pockets of scrumptiousness cross my path and my belly, I can only make an exception and share it with you all. using different spices and cooking techniques. I usually loathe Lebanese Baklava (Algerian Baklava is completely different) Chaldean Baklava is a poem: it is made with walnuts, already after my own heart, and spiced with cardamom and just the right dose of rose water and sugar. It is magnificent! And there was the eggplant casserole, very similar to the Greek Moussaka, but with minced beef, instead of ground, and spiced with a distinctive Chaldean Allspice, called Baharat. Baharat, available at most Middle Eastern Stores, is a blend of ground allspice, cinnamon, ground cloves, ground nutmeg, dried rose petal powder and ground black pepper. It is very fragrant and pungent and goes so well with red meat, chicken, vegetables and rice. 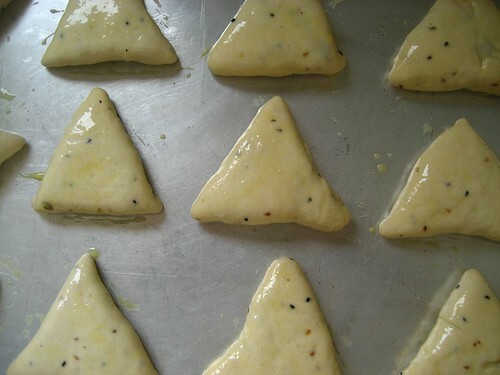 Those golden triangles you see are some irresistible meat pies. They are little scented pillows that enclose ground beef spiced with baharat, curry powder, onions and jalapeno for some spiciness. The dough is very soft and scented with fennel seeds, anise seeds, nigela seeds, sesame seeds and ground cardamom. The process, though simple, is a bit time consuming but every bit of it is worth the effort and minutes once your lips will yield to the aromas and your house filled with exotic spices. I recommend making the dough the day ahead as it will give the dough more time to rest and the flavors to mingle. - 2 1/2 cups milk, combined with 1 can (5 ounces) Carnation Milk. Dissolve yeast with water plus sugar. Let stand for 5-7 minutes until becomes foamy. Pour flour into large deep mixing bowl. Add dough spices, salt and mix. Make a well in the middle of the flour and add melted butter, milk, oil, yeast mixture. Rub flour with hands until flour is evenly coated. Begin kneading, adding more flour or water as needed, for 10 minutes, until the dough is soft and smooth. Place the dough in a lightly oiled bowl and cover it with plastic wrap. Let it rise for 1 1/2 hour or until doubled in size. Punch lightly to deflate. Knead quickly and put back in the bowl to rise. Cover and place in the refrigerator to rise overnight. Heat the canola oil in a frying pan. 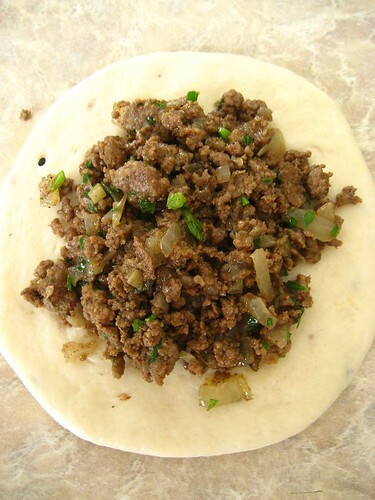 Cook ground beef with remaining ingredients. Set aside to cool. 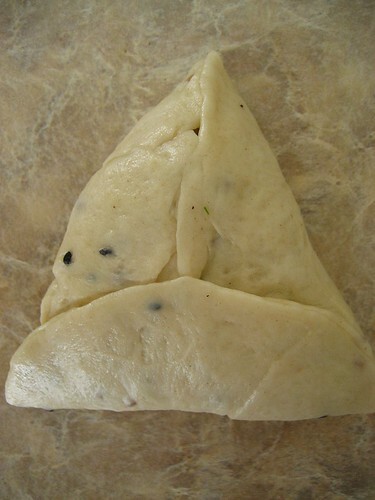 Divide the dough into little balls and roll out each dough into a circle to make your triangles. Shape the meat pies as shown on the photos. Seal well by pinching with your fingers. Brush on egg wash onto each triangle and place seam down on your prepared baking sheets. Bake for 30 minutes, or until they are nicely browned. Remove from baking sheet and cool on a rack. Enjoy warm or at room temperature. Store in freezer bags to keep its freshness and for the dough to remain soft. Chaldean cuisine is completely new to me. 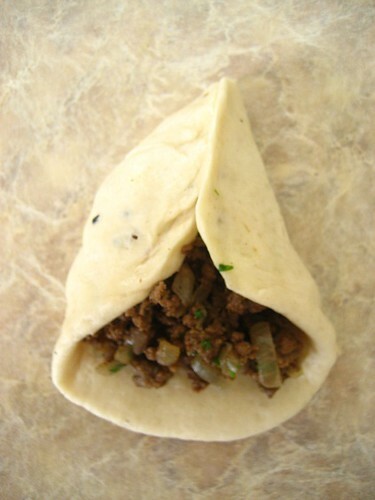 And you're right, these little meat pies are irresistible! thanks for introducing this to me! 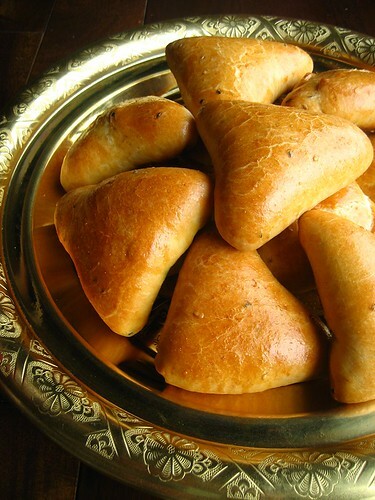 These meat pies look incredible! i used to drop in on your blog before you had your baby! I have never heard of Chaldean cuisine or the Chaldean people - ignoramus me. What is it like??? And what is the diff betw Algerian and Lebanese bakhlava? THis is interesting. - Lydia and Anh, thanks! my pleasure. - Anonymous, welcome back! Chaldean cuisine was a revelation to me as well. I would say it is more refined than other Middle Eastern cuisines I've had so far and uses a lot of spices, especially Baharat. Algerian Baklava has a flaky dough instead of phyllo dough, which makes it lighter (because we don't have to douse the dough with butter) and crispier. Warda ,ta recette parait fabuleuse....mais sur ce coup tu nous as oublié! ou est la traduction en français??? Bonjour je viens de découvrir votre très joli blog via "Le pétrin". Les recettes et photos sont superbes! Je vous invite à les poster sur CuisiCook.com A bientôt! Chaldeans are from Iraq and are usually of the Catholic faith. Their origins can be traced back to Mesopotamia. 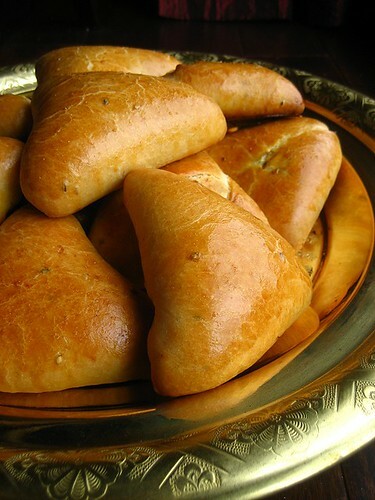 Being Chaldean myself, I have grown up with these meat pies and they are truly delicious. For those vegetarians out there, instead of using meat, my mom uses feta cheese and white cheese called queso blanco and some parsley. They are very tasty too. I too am Chaldean; we actually happen to be one of the earliest Semetic tribes, but I have to admit, our cuisine is the best.